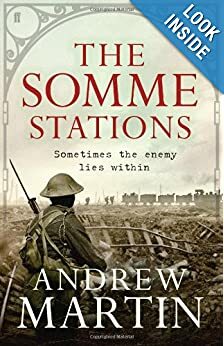 Chuck Macklin recommended the book "Somme Stations" by Andrew Martin. I just finished reading it and found it to be the perfect novel to read while building a model railroad with a WWI trench theme. The railroading details and life-in-the-military aspects were very interesting and get five stars. The author did a good job of capturing the fear that these men must have felt. The narrow gauge part of the story was great, loaded with realistic grit. 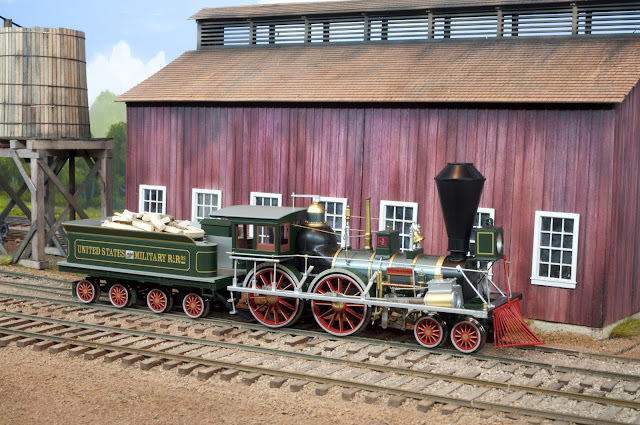 His use of a rail fan character was a clever way to load in the railway details for the rail fan readers. The Spurn Head Railway described in the middle of the book would be a great prototype for a small exhibition style layout. Here is a link to more info the Spurn Head. There were a few rough bits. I would have expected men from a railway outfit that get assigned the task of trench digging to at least garner some complaints, but his characters accept it in silence. The murder mystery initially was good, but it turns out to be overly complex requiring about 10 pages of exposition with lots of new information to tie it all together. For that it has to lose a star. Overall I enjoyed it and would highly recommend it for the character development and military railway scenes. It was the perfect book to accompany the WWI Project layout. 4 of 5 stars. This was a busy weekend. On Friday afternoon I picked up the latest locomotive from SMR Trains at the local FedEx Center. 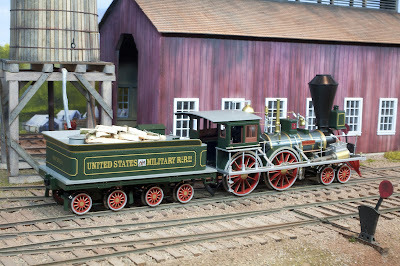 This was a custom painted model of the Osceola. It is an early 1840s Rodgers design. This is the first SMR locomotive I have purchased with the motor in the boiler. I am curious to test it out. but since I don't have any analog power packs, it will have to wait until I get the battery system installed. After picking up the loco I immediately headed to Stafford County for the Mid Atlantic Railroad Prototype Meet (MARPM). This was the first ever meeting of this group. They held it at the Hope Springs Marina in Stafford County with a great view of the RF&P Tracks. I presented at talk on modeling the USMRR Aquia Line. It was fun, as the lecture hall (actually a boat storage warehouse) was about 2 miles from Aquia Landing and right next to the rr tracks. During my talk four trains went by. It was great to see some old friends and make new ones. The meet was a success and they plan to have another one next year at a bigger venue as the demand seems to warrant it. Rob Hinkle showed me some old car cards. They would make good examples of cards to copy for my layout. On Saturday I went to the B&O Museum where I presented the same talk. The crowd was a little smaller than Friday night, but they really seemed to enjoy it. I made some new friends. Dan Toomey, my host, and I discussed a potential exhibit of the WWI layout next year. When I got home I unpacked the locos from the last trip. As I tested them, I noticed that Fury had been knocked out of tune. After some debugging I determined that the drivers were out of gauge (too tight) and the pilot truck was jammed and also shorting. The vestigial wiper on the front pilot truck was touching one of the pilot truck axles and was shorting. Vibration must have jammed the pilot truck suspension spring and knocked the wiper into the wrong position to short. After some tune up on the workbench she seems to be running smoothly again. But this does not bode well for continued road trips. These locos are relatively delicate beasts. Taking them to shows with the attendant vibration, temperature differentials and rough handling is not good for them. This may mean that the McCook's Landing road show may have a much abbreviated exhibit schedule than planned. While these are wonderful, beautiful models, these locos really could use a better pilot truck and draw bar designs. The draw bar is a particularly troublesome item if the loco has to be frequently lifted off the track. The insulated sleeve comes loose after repeated handling causing shorts. The draw bar could be made of a non-conduction material to reduce this point of failure. Furthermore, I think they would do better with a more permanent screw-on draw bars like the ones Hans Starmanns made for my old N scale steamers. If the tenders were permanently attached, the wiring from tender to engine could be done with thin hard-wires and no plugs. The plugs are another point of failure and problems. They are bulky and sometimes drag and catch on track work. The pilot truck design cause shorts, has a tendency to stick and really doesn't contribute to the tracking of the loco. A long term goal for me is to redo the pilot trucks with an equalized suspension and made with insulated materials. I am satisfied with their operation, but their always is room for improvement. Om Saturday night, I experimented with an animated gif version of the night fire photo. That is a hell of a barrage! The animated portions get a little pixelated in this type of animation. On Sunday Craig Bisgeier, Dave Ramos, Jim Lincoln, Ted Dilorio, and Amy stopped by to visit the layout, run some trains and have lunch. 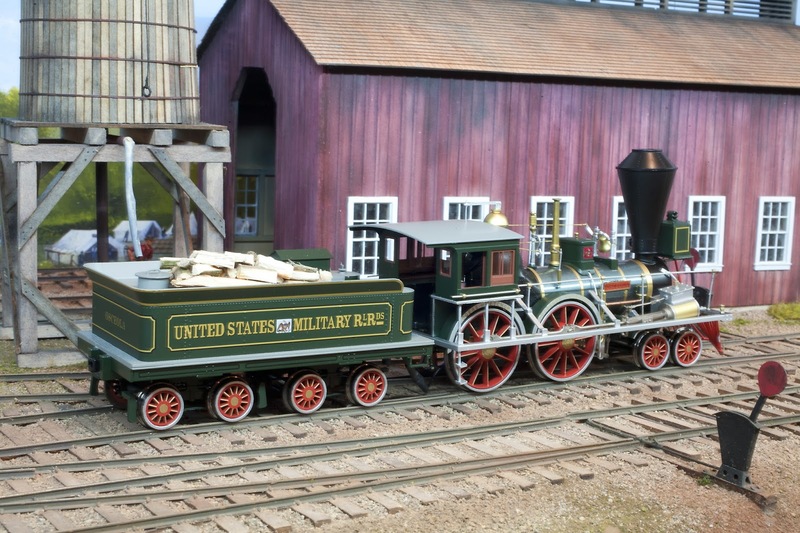 Jim scrounged through my N scale collection looking for cars he could use on his new N Scale layout. He found a few at a good price too. Later Dave Emery stopped by to drop off some tip cars for the WWI layout that he had painted. They were 3D prints from Tom Bell on Shapeways. In my comments to previous post I mentioned that a key challenge of this layout is to how simulate night operations. Since the railroad operates at night, but in black out conditions, it will be really tricky to simulate. 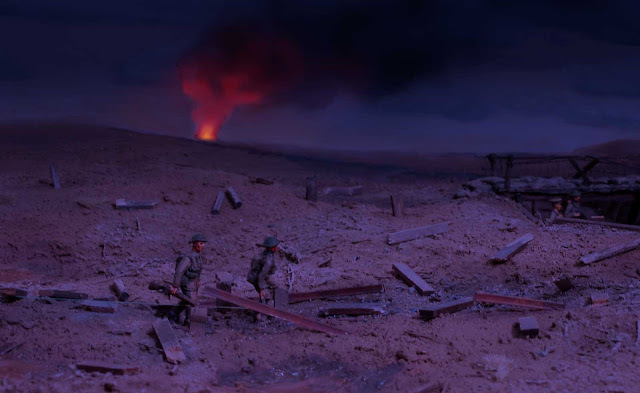 Artillery flashes on the horizon, droning of high flying night bombers, sounds of tanks and vehicles clankering along, the steady tromp of infantry marching off are all special effects that one could try. But this layout is not supposed to be a minature Minatur Wunderland. While it is fun to speculate about these, I think I will stick to Photoshop to convey the night ops, at least for the book. Here are some examples of what night photos might look like via Photoshop. I am just less than halfway done with the WWI project layout. This has been an interesting and fun diversion. I have enjoyed this opportunity to paint figures in colors other than Federal and Kersey Blues. 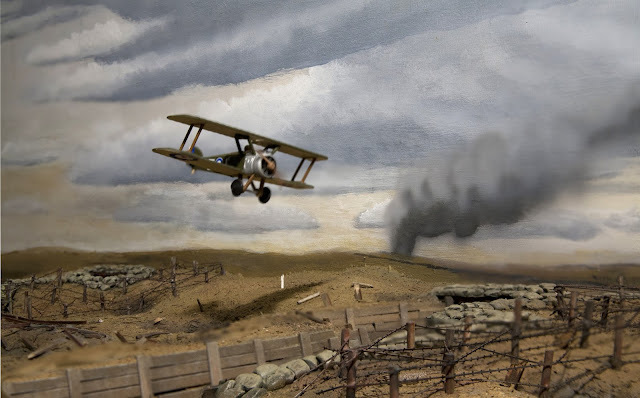 Added bonus, the biplanes in WWI were very cool. I am looking forward to getting back to Aquia Landing soon.